Addie Joss threw the 4th perfect game in MLB history on October 2, 1908. On October 2, 1908, Addie Joss pitched a perfect game, the fourth in Major League Baseball history, and only the second in American League history. He threw it at League Park, in Cleveland, Ohio. The Detroit Tigers, Chicago White Sox, and Naps were engaged in a race for the post-season at the time of the game, with the Tigers seeking to win their second straight pennant, the White Sox trying to win their second in three years, while the Naps were looking for their first. Three games remained in the regular season and the Naps were a half-game behind the Detroit Tigers as they headed into a match-up against the Chicago White Sox, who trailed the Naps by one game. Game attendance was announced at 10,598. The perfect game was the first of two no-hitters Joss would pitch in his career. 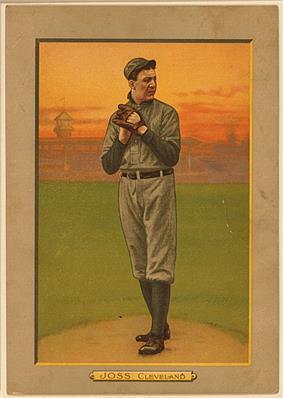 He no-hit the White Sox a second time on April 20, 1910, also by a 1-0 score. He was the only pitcher to throw two no-hitters against the same team until San Francisco Giant Tim Lincecum no-hit the San Diego Padres on July 13, 2013 and June 25, 2014.